Dia de los Muertos is a traditional Mexican holiday for celebrating and remembering those who have passed on. Join the Mesa community as they come together to rejoice their loved ones at the Dia de los Muertos Festival at the Mesa Arts Center in Downtown Mesa. October 27 – 28, enjoy a variety of food, a colorful mercado featuring local vendors and live entertainment at the festival where spirits connect. Parking and admission are free for the Dia de los Muertos Festival! 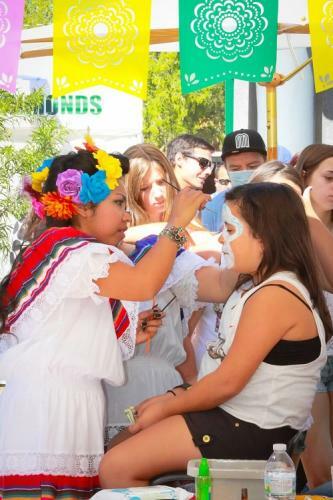 Get your face painted at the Dia de los Muertos Festival at the Mesa Arts Center. 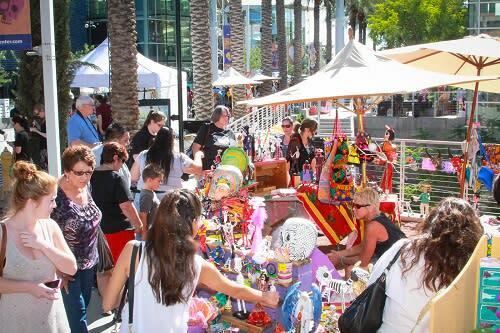 Local vendors fill the mercado at the Dia de los Muertos Festival at the Mesa Arts Center. Adrian’s was highlighted in USA Today® as the best restaurant in Arizona according to Yelp. The location may be small, but the food is big and comes at a good price. Adrian’s is not short of friendly faces, and they have been praised throughout the greater Phoenix area for the authenticity of their dishes. It’s worth dropping by this local establishment for any of your favorite Mexican dishes. Turn up the heat and experience the new wave Mexican soul food and Arizona style BBQ served at Jalapeño Bucks in Mesa. While their menu ranges from burritos to quesadillas, and even ribs, the restaurant is known for its signature salsas. Sweet green, mango and hot Mexican red are just a few of the flavors offered and sold by the pint or quart. If you are looking for a fun atmosphere and fresh meat options, Jalapeño Bucks is the place for you. When it comes to sweet treats, Flor de Michoacan takes the cake – or rather, the ice cream! The sweet shop prides itself on serving “Mexico’s finest treats” to those who are looking for some south-of-the-border confections. The fresh aguas frescas (fruit drinks), paletas (Mexican-style frozen fruit bars), and helados (gourmet ice cream) they offer are all made by hand and with natural fruit. Flor de Michoacan is a local sensation and worth a visit for anyone with a sweet tooth. Don’t miss this simple and colorful restaurant serving tamales and burritos from generations-old recipes. The authentic food served at Old El Paso Tamales also comes at a good price. This small Mexican restaurant holds up to the reviews; friendly staff and fantastic tamales! Take home a taste of Mexican cuisine with authentic food selections at Los Altos Ranch Market at the Mesa Ranch Plaza. The market offers a variety of departments including grocery, bakery, produce and cremeria, providing customers with Mexican treats such as chocolate flan, tres leches cake and guava paste. 50 varieties of tortillas, chips and masas are available at the tortilleria in the market, where tortillas are made by hand with fresh ingredients daily. If you are in need of ingredients to complete your own delicious Mexican recipe, be sure to stop in at Los Altos Ranch Market. Looking for the perfect hotel for your stay in Mesa? Holiday Inn & Suites, Hyatt Place Phoenix-Mesa, and La Quinta Inn & Suites Phoenix Mesa West will all put you within five miles of the Dia de los Muertos Festival at Mesa Arts Center.